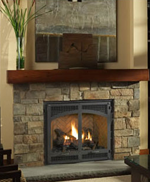 The National Fire Protection Association Standard 211 says chimneys, fireplaces, and vents should be inspected at least once a year for soundness, freedom from deposits, and correct clearances. Cleaning, maintenance, and repairs should be done, if necessary. Creosote can form when wood is burned incompletely. A smoky fire without enough oxygen emits lots of unburned tar vapors that can condense inside the fireplace flue and stick to it, possibly leading to a chimney fire. You can reduce creosote buildup in your fireplace flue by providing adequate combustion air, which will encourage a hot, clean-burning fire. Keep your chimney clean to protect your family's indoor environment. Call Hill's Heating & Air Conditioning today!